(From left) Mercury Marine&apos;s Lee Gordon, U.S. Interior Secretary Ryan Zinke, and BRP Evinrude&apos;s Jeff Wasil. Photo courtesy of NMMA. U.S. 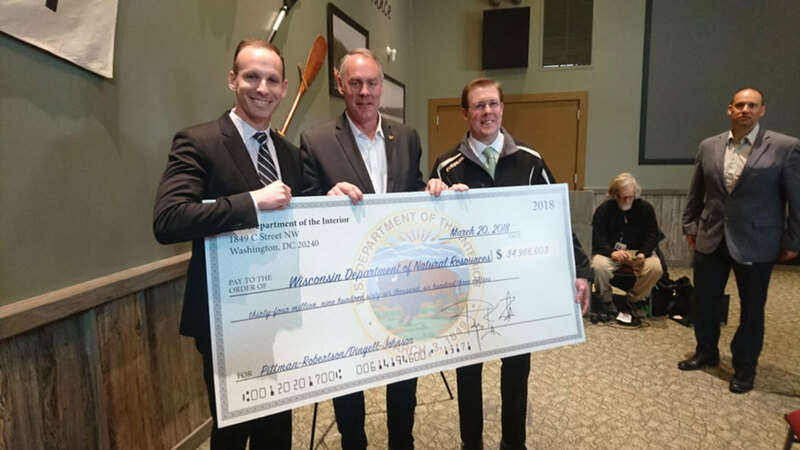 Interior Secretary Ryan Zinke and Lieutenant Governor Rebecca Kleefisch, R-Wis., announced the disbursement of the $1.1 billion Sport Fish Restoration and Boating Trust Fund across the United States on Tuesday. Wisconsin received a check for $34,966,603 that will be used to support state fish and wildlife agencies for fisheries research, habitat improvement, aquatic education and fishing and boating access facilities among other wildlife restoration, according to the National Marine Manufacturers Association. The Sport Fish Restoration and Boating Trust Fund, also known as Dingell-Johnson grants, are funded from fishing licenses and a manufacturers’ excise taxes on sport fishing equipment, import duties on fishing tackle, yachts and pleasure craft and a portion of the gasoline fuel tax attributable to small engines and motorboats. The grants are distributed to states on a yearly basis via a formula; they must be used by the state’s fish and game department, require a match of 25 percent non-federal sources, and can be used for management of wildlife or habitat and many other conservation and recreation related projects. Other grant announcements were made in Colorado, Florida and Ohio.